This is my father. Pounding everywhere he goes, his feet to the ground with purpose. As if shaking a fist at the demons underground, “I will defeat you!” Make no mistake, Michael Meneses is here. I knew it when he would walk across the wooden floorboards upstairs; from bedroom, to bathroom, to office. From office, to bathroom, to kitchen. Pastor Mike Meneses serving communion at Wellspring Church of Skippack. My father is home. Most of the curls on his head are combed back into greying waves. Quick, forceful combing in the bathroom mirror. All movement aims towards his purpose. He keeps his comb in that mirror. The same mirror on which he would draw secret steamed messages to his children between showers; surprise love notes that would appear and disappear just as quickly. This is my father. Jam and peanut butter on toast, cream of wheat, cheese and crackers. Simple cravings, really. Simple and unapologetic, like his convictions. Straightforward, like his certainty. Clear and sharp edged, like his reasoning. Our pallets are the same. This is my father. Spontaneous dancing with his children in his office, as if on some Latin dancing show. If we got too clumsy, stumbling underfoot, he would simply lift us atop them, where we would glide effortlessly across the carpet with his movements. Movements that revealed a spirit of celebration, hidden, often, amidst an all too demanding and, unbeknownst to many, a profoundly wounded life. When it came to finding light in the darkness, this man taught me how to pray, and how to samba. This is my father. The man who pastors his church with vigor, and grace. Whose words can be soft while his voice is strong. The man who calls troops into spiritual battle, while in the same moment inviting his people into eternal peace. His is a faith to move mountains, and a heart that never doubted that God could. This is my father. Unmatched is the delight that lights up his face in the presence of his grandchildren. Children, who reminded him of a time in his own innocence, when he could run carefree through the world, the wind at his back, his feet light on the ground. A time when the smile that cracked upon his face was boundless, when laughter bubbled up from his little belly and split open his little lips. A time when the elation he felt while chasing a friend or biking down a street had the potential to fill the world. And it would fill the world, he knew, for God’s unconditional love is evident in the joy of little children. It was this love that he pointed to every day until the very end. This is my father. This determined, faithful, convicted, impassioned, life-loving child of God. I imagine that his heart pounds in his chest once again; that his laughter fills the chambers of that great kingdom, as he races through the streets and dances on the feet of his Father. In that place where the love notes never disappear from the mirrors and where the demons are utterly defeated. There, where he is fully known and eternally celebrated. This is my father. My father is home. 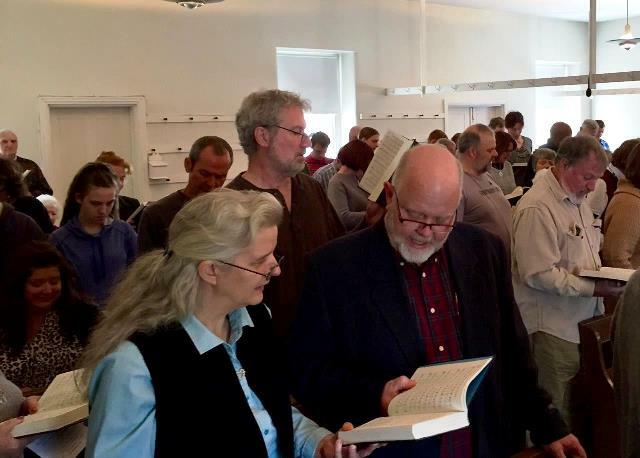 Four Franconia Mennonite Conference churches met on the Sunday before Thanksgiving to proclaim the One who unifies them even amidst the diversity of opinions, theology, wealth, and political persuasions among other things. Ideas had been brewing in the hearts of several pastors of small churches in close proximity to each other for some time, to find ways to support and resource each other. Last summer, that dream became a reality as the pastors began to meet together. One of the outcomes of those meetings was this joint Thanksgiving worship service. The pastors and congregations of Wellspring Church of Skippack, Frederick Mennonite Church, and Spring Mount Mennonite Church gathered at Methacton Mennonite Church on November 20 for the anticipated and momentous event! People who usually have plenty of room on their benches, were packed in like smiling sardines. Singers who ordinarily can identify every voice, were overwhelmed with the grand blend of harmonious praise. 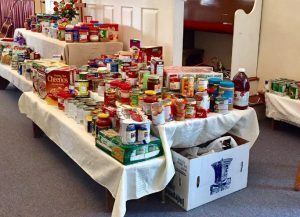 A colorful mountain of boxes and cans and bags began to grow in the front of the sanctuary as people streamed in with their offerings of food to be shared with their neighborhood food pantry. An open conversation among the four pastors, inspired comradery with other churches who also have an average of 15-30 members and who also each share the vibrancy of unique vision and mission intentions, centered around following Jesus Christ. 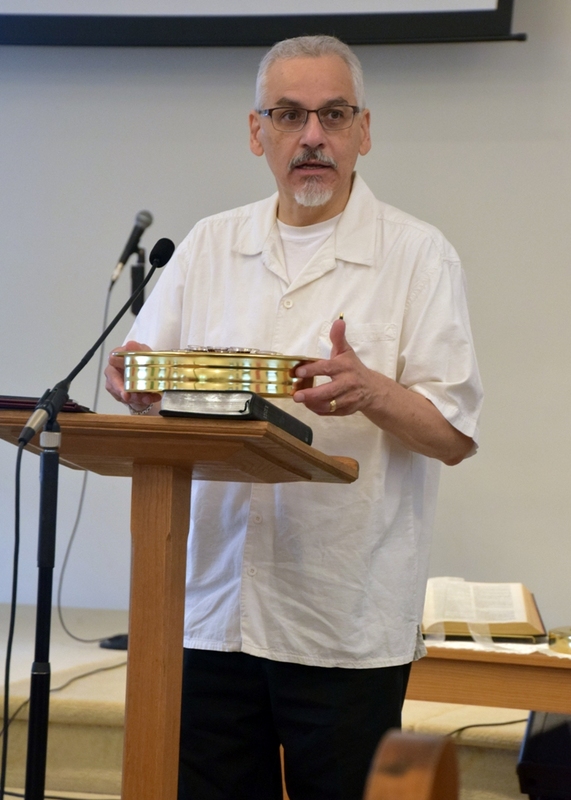 Three pastors were happy to hear Mike Meneses share the Word and four song leaders led their congregations in a round of “Go now in peace,” (#429 HWB). Friendships were lit and fanned into beautiful flames as we then spent informal time together around the tables of food and drink, with hopes of more joint ventures to come. Emulating what was shared at Conference Assembly two weeks earlier, we celebrated what is being planted and watered in our separate congregations and were inspired to notice how God calls us to grow into the days before us.